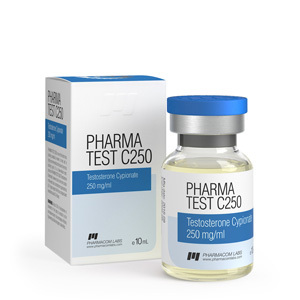 Pharma test C250 is an effective steroid drug from the company Pharmakom Labs, whose active substance is testosterone cypionate. Testosterone cypionate is one of the most prolonged drugs – due to such a long-acting effect, the active ingredient is present in the blood within two weeks after the injection. The drug requires proper preparation of the course, as it has the ability to aromatize. The ability of the active component to convert to estrogen causes the side effects of testosterone cypionate: the accumulation of excess fluid, gynecomastia, testicular atrophy. In order to prevent these phenomena, the course of testosterone cypionate must necessarily include anti-estrogen drugs. They need to be connected in the second week of the course, continuing to use until the end of the course. Conversion of the active ingredient to dihydrotestosterone causes androgenic side effects of the pharmacyte, such as increased skin oilyness, the development of acne, and increased aggressiveness. Reduce these phenomena will help drugs that prevent conversion. If the course testosterone cypionate is scheduled for more than a month, you must also connect gonadotropin. Pharmatest (testosterone cypionate) is advisable to buy for mass-supplement courses, their duration should be four to ten weeks. The maximum single dosage is 750 mg. For optimal results, injections are performed once a week. It is proved that an increase in the weekly dosage of more than 1000 milligrams significantly increases the side effects, while the effectiveness of the course does not increase. Responses of athletes about this drug are unambiguous: it has a very high efficiency in relation to the rapid set of muscles, but the number of side effects requires competent preparation of the course in order to avoid health problems. If you have determined that this particular drug is optimal for you, and you want to buy testosterone cypionate, the price of which is acceptable, order it from us! You will be sure that you will receive a quality product, excellent service, an effective course.